Click on the photo to enlarge it. Story and more photos here! 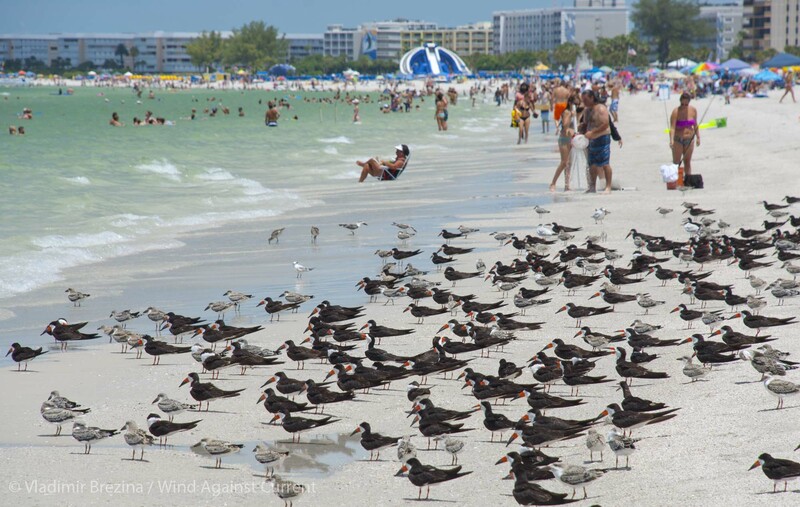 This entry was posted in Nature and tagged Beach, Birds, Black Skimmer, Florida, Photography, St. Pete Beach. Bookmark the permalink. Do the birds wonder what all the people are doing there? Nice to see so many birds as well as people. They look very expectant. Oh, wow, how special. That explains the different plumage. Getting past them was not easy. They defended their turf! People aren’t used to having the tables terned on them are they? Terns have an arc all to their own, looking all ahead full. I’m particularly fond of terns, they have a sophistication that the gulls lack. What great beaks they have! Love it – everyone needs to enjoy the beach! Two sets of creatures from two different worlds —almost looks like a put-together of two separate photos. But you didn’t, did you. Not at all. WOW! And I was always excited to see ONE black skimmer. I love those birds! Cool! Once in a while I would see one over on Staten Island, skimming the surface of the water, close to shore, late on a summer afternoon. I’ve never seen them in NYC—or at least I am not aware of having seen them, because I did not know what they were until this day in Florida.